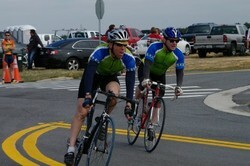 Stock photo -- Dave Z. and Pat S. racing. 12 Aug 2010 - Osceola Velo Club's newest club member Ron Metcalf joined racing regulars Pat Schlager and Dave Zak at the 3rd race in the Summer Sizzler Criterium Series at Drew Landing just south of Clermont, FL. This was Ron M.'s first race ever. 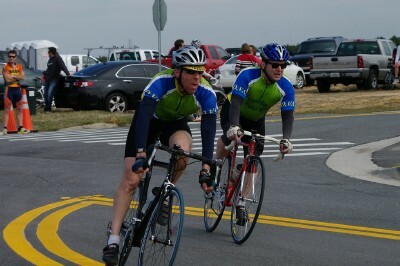 Unfortunately for Ron, he suffered a mechanical when his chain jammed, thus ending his race early. Dave Z. rode strongly in the small field, while Pat S. got off the front a couple of times but was unable to bridge across to the break. Still, everyone stayed upright and "enjoyed" some racing in the hot/humid Florida summer. 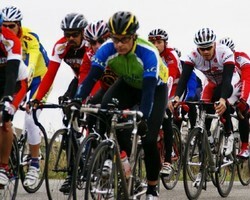 03 Apr 2010 - Osceola Velo Club's Dave Zak and Pat Schlager raced in the truely epic Webster-Roubaix Road Race held near Webster, FL. The 2.5 km section of unpaved roadway that cuts its way between pastures was not as sandy (and therefore, as skiddy) this year, but the 7 times over it on 23 mm wide tires still makes this race what it is. The Masters 45+ raced for a total of 105 km in the warm, dry conditions with Dave Z. and Pat S. finishing in 30th and 34th place (respectively). Dave and Pat's placements score them 6 and 2 points (again, respectively) in the season-long Florida Points Series as well as in the Florida Cup Series. Nice. Check out the photos. 19 Dec 2009 - Osceola Velo Club's Pat Schlager, Dave Zak, and newest club member Jeff Blain lined up for the 3rd race of the Drew Landing Criterium Winter Training Series held just south of Clermont, FL in the cold, windy, and overcasted early morning winter weather. The strong WNW winds prevented any attacks from sticking, so the B-race peloton stayed pretty much together throughout the 40-minute race. Jeff B. moved around within the peloton staying sheltered from the wind, while Pat S. occasionally went to the front for a pull and even for an attack with 2 laps to go. Pat's plan was to string out the field allowing Jeff to sit in and possibly try a final-lap counter-attack, but the field wasn't biting and simply left Pat off the front to tire on his own. Jeff saved his energy for the uphill final sprint and despite being slighty boxed in, crossed the line in 6th place, thus scoring one point in the Winter Training Series. Great racing, team! Check out the photos. Pat S., 2010 Webster-Roubaix Road Race. Jeff B. racing at Drew Landing.